I was talking about a cup of tea in the cafe halfway to Paro Taktshang on my Facebook wall and the few comments there inspired me to write it in my blog. The Cafe is beautifully located, facing the gigantic cliff and the breathtaking Taktshang Monastery. The benches are strategically setup that one could just sit there and lose oneself. Who won't like to sit there and enjoy a cup of tea? If only a cup of tea was just a cup of tea! The cafe belongs to BTCL and they only had tourist in their list of costumers. In their description tourist means someone who earns in dollar, and therefore no Bhutanese can be tourist. A cup of tea cost Nu.84 and there is no concession for Bhutanese who could buy a whole meal with so much. Bhutanese are expected to bring their own packed lunch and tea, and it is written in bold: "No picnic Lunch allowed here", which also goes out to Bhutanese. 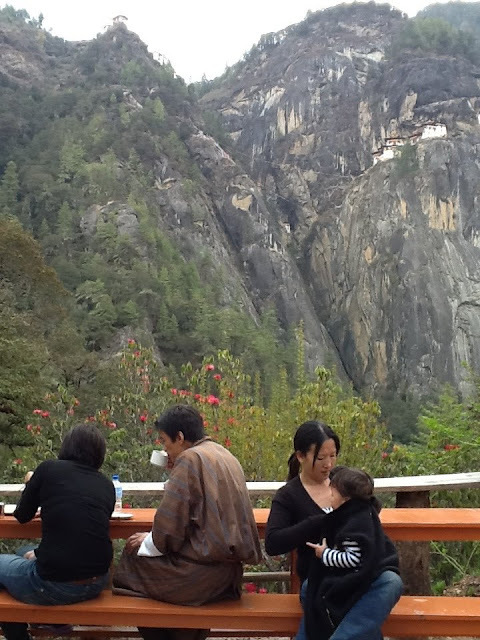 So I say, there is a beautiful Bhutanese Cafe half way to Taktshang that is only meant for tourist. And this is one among many beautiful and luxurious facilities in Bhutan catering to just foreign tourists, because there are some people up there who think Bhutanese don't deserve to have fun. But the twist in the story was that I always wanted to visit that cafe, and coincidentally we were hungry and tired so we had to sit on those beautiful benches and drink funny tea- it didn't even taste good, we had to ask for more tea bags. Lesson learnt is that, there is no gold in that tea therefore don't forget your packed lunch and tea if you are head to Taktshang. That is why stratification leads to inequality and relative poverty. Nice thought sir Passu. Actually, there should be such cafe at cheaper cost for indigenous people, who are like family of same household under the umbrella of Drukpa Kingdom, not just lust for money and daylight robbery, making an ordinary tea elusive. Hehe... we should also think about the height at which the cafe is located and things that have to be carried up there. Nice post and reflective one too. Many things in Bhutan are not for Bhutanese - they are for tourists. For instance, Bhutanese get to watch Tshechus once in a year but tourists they can watch it twice a day at any time of the year. This is alarming I know. "Happiness is a place" says TCB's slogan and maybe that's place where you can have the most expensive cups of tea ever. Regards PaSsu! Keep posting! You know, I would bet that almost all tourists would actually be delighted to share the bench space with Bhutanese pilgrims like yourself. I know that Bhutanese folks carry picnic meals in the tiffin or Thermos so garbage from picnickers shouldn't be too much of an issue the way it is in other places. Sharing the space should be a given. Anyway, plans for a new visitor centre are underway so perhaps the scheme will be changing soon enough. I really appreciate your posts. Really speaking, you are a great socialist. Plz. keep on posting. Not all foreign guests are tourist either But there is a notion that it is OK to charge double triple or more if you see someone who is not Bhutanese Earning a local salary and working the same hours if not more as the expectation for us few native English speakers is that we also need to provide as much assistance as possible to any other teacher or eager to learn adult This is part of our responsibility So how come I have to pay 3 or 4 times the price that locals do for tea, for taxis and for anything else that Bhutan decides I can afford to??? Vickey and Ian, I am sorry to hear about that. I know two of you are serving in the schools far from the necessary comforts and you guys deserve special treatment. Next time you guys go around take a Bhutanese friend and make him fight for you- I do it for my sister inlaw. In fact I don't let her walk in until I confirm the price lol. I hope you have good time and take back good memories. 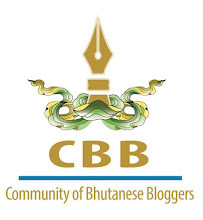 My apologies to Tourism Council of Bhutan for making them the owner of the Cafe, when it actually belongs to BTCL. I thought the two were same. Forgive my ignorance. Thank you Thuji for spotting my error and informing me. I have changed it right away. Continue supporting me.